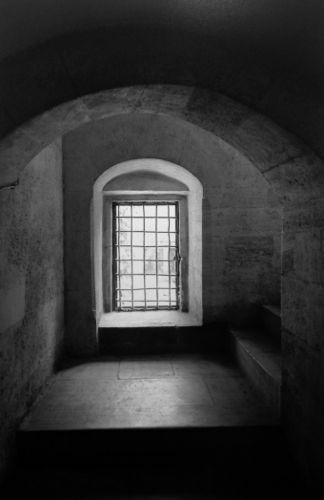 Back in December, I attended a photography exhibition at the Millî Reasürans Art Gallery in Maçka of Aykut Köksal’s black-and-white photographs capturing Mimar Sinan’s (1489–1588) architectural masterpieces in Istanbul. 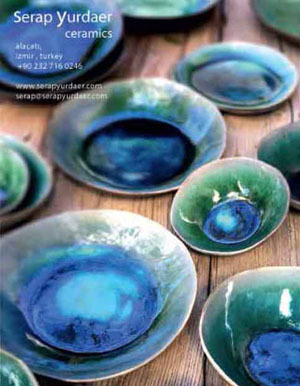 Köksal, who is an avid photographer wtih a degree in architecture from the Mimar Sinan University, took the photographs in the course of one year in 2006. His aim was to highlight the relationship between light and architecture and he focused on Sinan’s work in Istanbul, from the most renowned – the imposing imperial Süleymaniye Mosque (above) – to the lesser-known mosques scattered around the city. 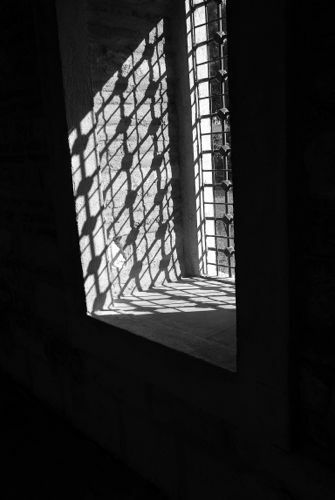 The name of the exhibition, Silence and Light, was borrowed from the title of a 1969 lecture by the great American architect Louis Kahn, whose own work was greatly inspired by the use of shadows. By photographing Ottoman spaces, Köksal wanted to ‘underscore the transcendental reality of architecture’. 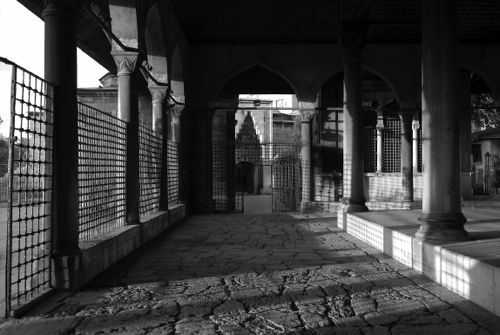 Indeed, he plays with light effectively and captures a sort of tranquillity in his interpretations of Sinan’s buildings. Sometimes his work depicts wide exterior shots of the buildings such as the above again showing the Süleymaniye Mosque (built 1544–55) and its grand courtyard with ancient porphyry columns – some bathed in light, some concealed in shadow. Sometimes, however, Köksal focused on a small part of the building. His take on the Rüstem Pasha Mosque (above), the second of Sinan’s imperial mosques built 1561–63, shows a discreet stone staircase, which is the only way to gain access into the Mosque. 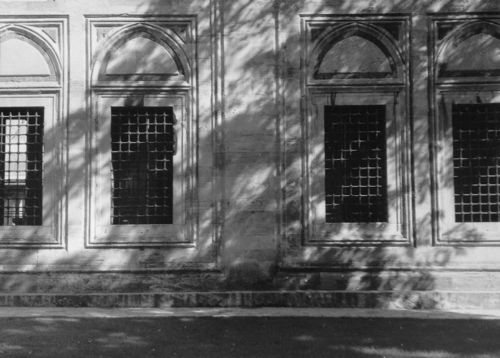 His photograph of the Şehzade Mehmed Mosque (above), the first of Sinan’s three imperial mosques and built 1544–55, shows its exterior windows with streaky shadows created by the many trees which line the generous courtyard. ‘Mosques built during the classical era of Ottoman architecture intended to have as much light as possible illuminating the interiors,’ says Köksal. This is definitely true in the above photograph of the Sokullu Mehmet Pasha Mosque located in Azapkapı below the far end of the Hippodrome, and built between 1577 and 1578. Köksal took the photographs in black and white as that is the ‘best way to express light in photography’ and because ‘black-and-white photography has a strong capacity for abstraction’. 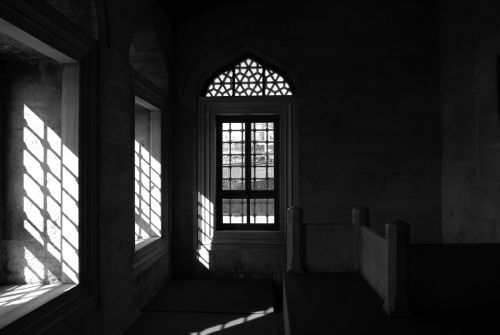 His photograph of the Nişancı Mehmed Pasha Mosque, located in Karagümrük in Fatih, shows perhaps the best expression of light in his entire series. 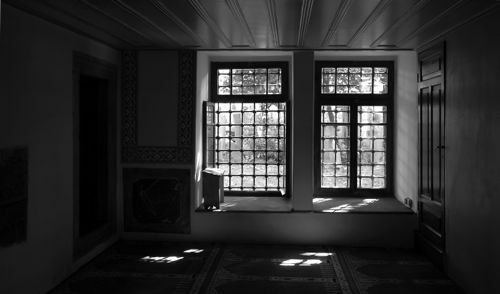 In the above image showing the Sinan Pasha Mosque, located on the main square in Beşiktaş, Köksal captures the interior of one of its small rooms, the light casting a glow on the carpeted floor. 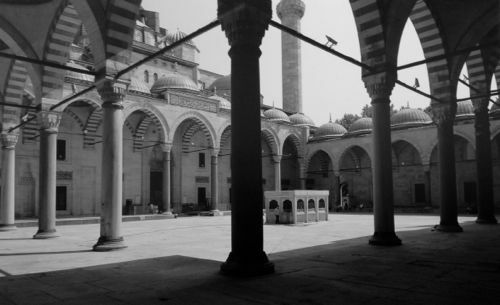 The Mosque was commissioned by Admiral Sinan Pasha and built in 1555. It is said to resemble the Üç Şerefeli Mosque in Edirne, which was the largest mosque in the city until Sinan built his ‘masterwork’, the Selimiye, in the late 1560s. A five-minute ferry ride will get you to Üsküdar where Köksal captured the above image of the Mihrimah Sultan Mosque, built between 1546 and 1548. It is a well-balanced shot in which the ground of the portico and the gate are the main attractions. 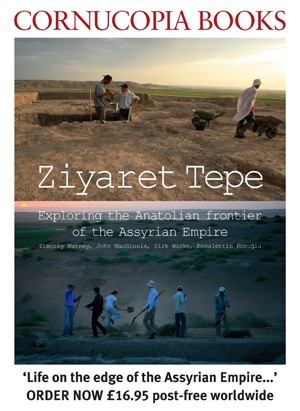 The latest Cornucopia, No 50, includes a 14-page article about three of Sinan’s most important mosques – the Süleymaniye, the Rüstem Pasha Mosque and the Şehzade – with photographs taken in 2013 by Fritz von der Schulenburg. Images 1, 5, 6, 7 and 8 courtesy of Millî Reasürans Art Gallery. Images 2, 3 and 4 taken by Victoria Khroundina at the exhibition.